Hi everyone! I wanted to share a pretty Valentine's card that I was recently published in the Winter Issue of PaperHaus Magazine. If you haven't checked out this fabulous issue yet, grab a cup of coffee and check it out here. It is full of amazing inspiration and several tutorials. For my card, I used the Echo Park - Yours Truly Collection. I used my Silhouette Cameo to cut a heart from Lori Whitlock. 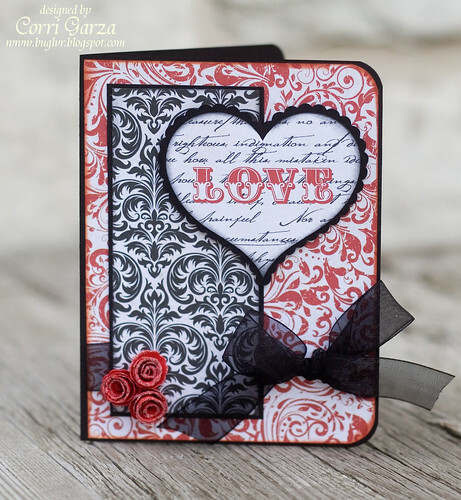 Using the grid in the Silhouette Studio software, I lined up the "love" portion of the paper on my mat and then cut the heart. I was super excited that it worked perfectly the first time. I found it was easiest to place the love on the center of the mat. I cut three tiny little roses from this file by Lori Whitlock. I sprinkled them with some fine crystal glitter and added an organza bow.